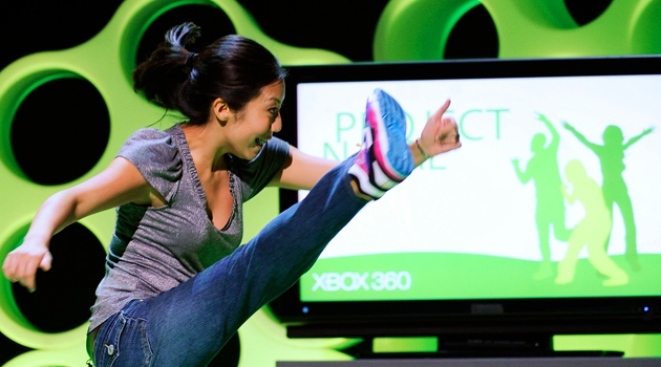 A demonstration is given of "Project Natal" at Microsoft's XBox 360 media briefing in Los Angeles, California. Dear readers, I have seen the future of gaming! Here, see for yourselves. Check out the preview for the upcoming sci-fi flick “Gamer,” and you’ll see a future in which video game enthusiasts use their bodies to control their games. In these movie-imagined days to come, a gamer moves his arms and, voila, his in-game avatar moves its arms in response. He moves his legs, and the avatar moves its legs too. Talk about precision controls! Of course, in this future gamers manipulate real people rather than digital people, forcing these poor meat puppets to partake in a first-person shooting game gone awry. At their E3 demo last week, Microsoft presented a not-so-distant future in which Xbox 360 players will use their bodies — and not handheld controllers — to play their video games. Move your arms and your avatar moves its arms. Move your legs and your avatar moves its legs. Just like in the picture shows! Certainly one thing that’s been made crystal clear not only by last week’s E3 extravaganza but by this week’s launch of a new Nintendo gadget: The future of gaming is in motion. In addition to Project Natal, Sony last week unveiled its own as-yet-to-be-given-a-catchy-name motion-control device. While Project Natal uses a special camera, depth sensor and microphone to read players movements and recognize their voices, Sony showed off a controller that looked like a bubble-topped magic wand — a magic wand that works with the PlayStation Eye camera to let gamers interact with the virtual world before them in a highly precise manner. Pick up a sword and swing it around. Aim your bow and fire arrows at oncoming enemies. Glitzy demos aside, Microsoft and Sony are really just trying to catch up to the reigning king of motion controls — Nintendo. And this week, Nintendo is taking its own ground-breaking motion controls even one step further with the launch of Wii MotionPlus. Say what you will about the Wii's "waggle" controls, but Nintendo's motion-sensing Remote and Nunchuk — launched with the Wii back in 2006 — have proven to be a major milestone in video game history. No, Nintendo didn’t invent motion controls, but it was the first to get them (mostly) right. And the fact-of-the-matter is, the Wii has not only changed how we play video games, but it has changed who plays video games. That is, people who would have never otherwise thought of themselves as “gamers” are now happily playing and buying games. And it’s the Wii’s motion controls that were the key. “The only real progress the industry had made in the last few years before the Wii was to add more buttons to the controller, which posed a significant barrier for novice gamers or for anybody who couldn’t master 30-plus combinations of buttons to play a shooter or a fighting game,” Cai says. Motion controls — which allow for a more natural and real-world way of interacting with video games — just make sense to people. You swing the controller like you would your arm when playing a tennis game. You turn your controller side to side like you would a steering wheel when playing a driving game. What’s not to get? After last week’s announcements, it’s clear that Sony and Microsoft understand the importance of this newfound democracy. With Wiis now residing in more than 50 million homes worldwide, it’s kind of hard not to. So what does Nintendo think about their competition jumping on the motion control bandwagon? “We think it’s flattering,” says Cammie Dunaway, Nintendo of America's executive VP of sales and marketing. The Wii MotionPlus, which launched Monday, is a small device that clicks into the bottom of the Wii Remote — a device with a gyroscope that detects the twisting motion and rotations of your arm and wrist. What that means, Moore says, it that allows for “many more degrees of sensitivity” and “authentic sports motion” in games like “Tiger Woods PGA Tour 10” and “Grand Slam Tennis,” both of which launched this week in conjunction with MotionPlus. Having now played “Tiger Woods,” I can say that it is hands down the most enjoyable golf game — and the most realistic one — I’ve ever played. With the MotionPlus attachment, it did a superb job sensing the swing of my arm, the tilt and twist of my wrists and the speed at which I hit the ball. As I swung the Wii Remote like I would a real golf club, it replicated my movements on screen with amazing accuracy. I was able to tell immediately that I have a problem with fades (curving my ball to the right) and, with that kind of feedback, I was able to improve my swing over the course of 18 holes. Meanwhile, I had wondered whether increased motion sensitivity could make a game more difficult to play and thus less enjoyable for the average person. But the “Tiger Woods” developers did an excellent job balancing control sensitivity with good ol’ fashioned fun. And they even tossed in a killer disc golf game as part of the package … a game that senses and replicates the Frisbee-tossing flick of your wrist like a champ. Without a doubt, the motion control craze is on. Sega has just launched “Virtua Tennis” for the Wii, putting MotionPlus into action on the virtual tennis courts. “Wii Sports Resort” arrives in July and “Red Steel 2” launches in the months to come — both of which make use of MotionPlus. Meanwhile, Ubisoft has announced that, this holiday, it will launch “Your Shape,” a fitness game for the Wii that comes with a special camera to scan players' bodies, read their real-world movements and give them personalized fitness coaching. (Think Project Natal lite). Still, while motion controls seem certain to become a cornerstone of video gaming, the future is far from clear. Cai believes Nintendo’s MotionPlus will fare well. Available for $20 — or less if purchased as a bundle with “Tiger Woods PGA Tour 10” or “Wii Sports Resort” — the device is the right price and Nintendo has laid the right groundwork, he says. But motion controls are far from a sure hit. The motion controls in the PS3’s Sixaxis controller, for example, have been greeted with little more than a derisive shrug. And so with Sony and Microsoft’s devices a long way from hitting the shelves, Cai says many questions remain. Will the technology work as well as promised at E3? Will Microsoft and Sony be able to find the right price point? And will their players — hard-core types perfectly happy with mashing buttons — be eager to adopt this kind of casual-friendly hardware? More importantly, Cai says he’s keen to see what game developers do with this new motion control technology.